So many of the anti-aging skin care products touted today are little more than “hope in a jar”. Most don’t penetrate skin’s layers deeply enough to produce real results. But now, that may be about to change. 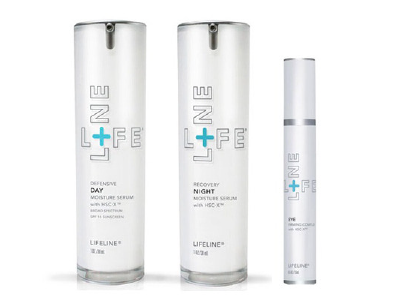 With Lifeline Stem Cell Skin Care, the repair process actually begins at the cellular level. Their skin care products contain patented extracts from non-embryonic stem cells. These extracts are then encapsulated within nanospheres to ensure that they remain active in the products. These active extracts contain peptides, amino acids and enzymes which help increase collagen and elastin, resulting in firmer skin. Lifeline Skin Care also uses small molecule technology, ensuring that the products penetrate the skin fully, boosting collagen and acting like retinol to restore skin’s firm, smooth texture. The addition of other beneficial ingredients such as anti-oxidants, vitamins and minerals round out the formulations. Most skin-care lines make fantastic claims, but Lifeline Skin Care’s products are backed up by extensive research by their parent company, International Stem Cell Corporation. Back in 2010, International Stem Cell Corporation discovered that the firming peptides in the stem cell extracts could help skin look years younger- up to 15 years younger, for some users. They also discovered that the way to keep them active was through encapsulation. Other skin care products may contain peptides, but if they haven’t been encapsulated in nanoshperes, the way Lifeline’s have, they are probably not active. That’s a little like buying yogurt for the probiotic properties of live cultures, and discovering that the cultures are not live, after all! The other secret “weapon” in Lifeline Stem Cell Skin Care products is small molecule technology. Without it, even the most beneficial ingredients in expensive skin creams and lotions won’t be able to penetrate the skin, where they can stimulate collagen and elastin. Instead, they’ll mostly just sit on the surface of skin. Dr. Russell Imboden carries Lifeline Stem Cell Skin Care products in his office, because, as an aesthetics professional, he knows skin and knows what will work and what won’t. If you’d like more information, please contact us, and visit our website for information on other ways we can help you with other aesthetic issues and concerns.